The difference in Tauck’s small ship cruising lies in the choreography – the combination of all-inclusive cruising with unparalled exploration and uncommon access on land. Tauck Small Ship Cruising combines the rewards of sailing aboard a private yacht and comfortable expeditionary ships with Tauck’s signature all-included sightseeing and destination expertise ashore. Handpicked for each destination and designed to access ports the bigger vessels can’t, our small ships set sail on voyages of discovery from the Aegean to the Baltics, and from Asia to Antarctica. You enjoy exclusive experiences ashore that take you to the heart and soul of the world’s most unique cruise destinations. Experiences well timed, at the best time of day to avoid crowds. With Tauck, your fare is your passport. For one upfront price, you’ll enjoy world-class hotels, exquisite meals and drinks, jaw-dropping excursions, and once-in-a-lifetime experiences on distinctively inclusive cruises. This is a truly seamless journey, where all the details seem to magically fall into place. This is all-inclusive, for those who refuse to settle for the ordinary. Private Tauck Shore Excursions valued at AUD $5,310 Value! 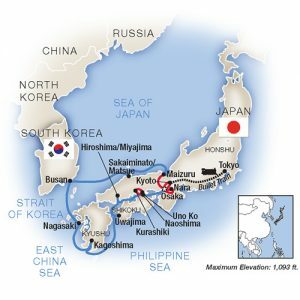 Spend fourteen days discovering the “land of the rising sun” on the ultimate Japan cruise – with eight nights aboard our elegant yacht L’Austral and five nights at premier hotels in the heart of Kyoto and Tokyo. Two nights each in Barcelona and Lisbon. 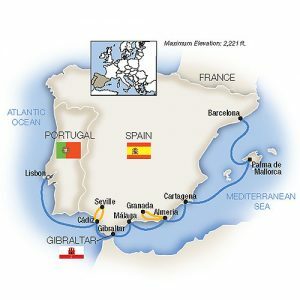 Set sail for a 13-day Spain and Portugal cruise aboard your Windstar yacht as you chart a course for a treasure trove of discoveries along the trade routes of the first Portuguese and Spanish explorers. 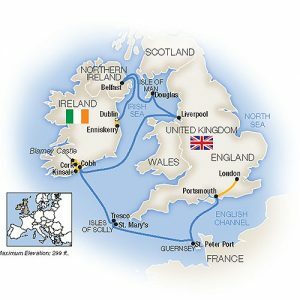 Our 12-day British Isles cruise aboard a luxury small ship takes you to major cities in Britain and Ireland, as well as islands off the beaten path; the cruise runs both east and west. The eastbound version begins with two nights at a premier hotel in the heart of Dublin, then sail to the Isle of Man in the Irish Sea, where you’ll discover its cultural mix of Celtic, Norse and British influences. Explore the spectacular fjord country and Norwegian culture past and present on a seven-night Norway cruise aboard Le Dumont d’Urville – sailing between Bergen and Oslo – stay one night at a downtown hotel in both historic cities, and spend a day in Göteborg, Sweden. 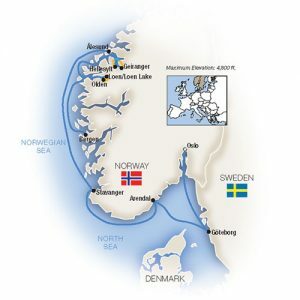 Norwegian Fjords & Coastal Treasuresbegins in either Oslo or Bergen. Our 10-day Dalmatian Coast cruises explore incredible Venice and Croatia’s Adriatic coast with a 7-night voyage aboard the luxury yacht Le Lyrial. Discover centuries worth of castles, palaces, and cultural treasures from Venice to UNESCO World Heritage Sites like Dubrovnik, Kotor, Diocletian’s Palace and more. 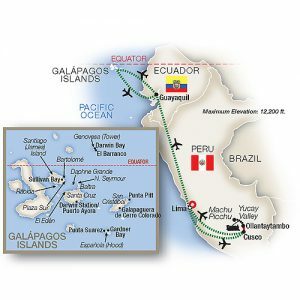 Join us on our newest Galápagos Islands holiday, a journey of cultural exploration and expeditionary discovery from Incan citadels in the cloud forests of the Andes to the remote volcanic islands of the Galápagos. *Terms and Conditions Apply, Prices shown are per person, twin share in AUD inclusive of all discounts, taxes & fees. Prices are for the categories as specified. Prices are subject to change and availability. Once the lead in stateroom is sold out, prices may increase to a higher fare, or be withdrawn without notice. Cruise line offers are valid for new bookings only and are not combinable with any other offer. Valid for new bookings made and deposited by 2 September 2018, offer cannot be applied retrospectively. Offer is applicable on any 2019 bookings deposited by 2 September 2018. Air Credit offer must be used on accompanying flights booked through Tauck Australia. Air Credit cannot be transferred, redeemed for cash or discount on your Tauck land journey, river or small cruise. Complimentary hotel night offer not valid on Christmas Markets River Cruises. One room per reservation. Hotel space is not guaranteed and is subject to availability at the time of booking. Other conditions apply. Contact your travel advisor for further details on black out periods and restrictions.